Thank you to Wendy Shuttleworth and Lenka Cathersides for the following research. 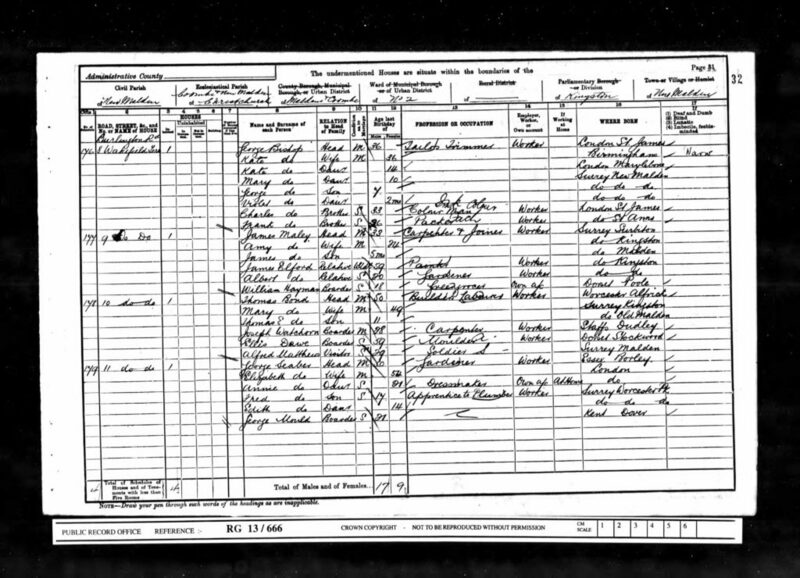 George Lewis Bishop was born in the 3rd quarter of 1893 in New Malden, Surrey to tailor George and Kate (nee Moreton). At the time of the 1901 Census, the family lived at 8 Wakefield Terrace, New Malden. George was working as a tailor’s trimmer and Kate was at home looking after their children: Kate, Mary, George and Violet. The household further comprised of George Lewis Snr’s brothers: artist’s colourman Charles and packer Frank. At the time of the 1911 Census, the family lived at 6 Coombe Parade, New Malden. George snr was working as a tailor and Kate was at home. The household further comprised of their children: business assistant Kate; dressmaker Mary; warehouse clerk George; Violet, Doris and Edith and George snrs’ brother, artist’s colourman, Charles. Kate stated that she had given birth to six children. The accommodation had six rooms. 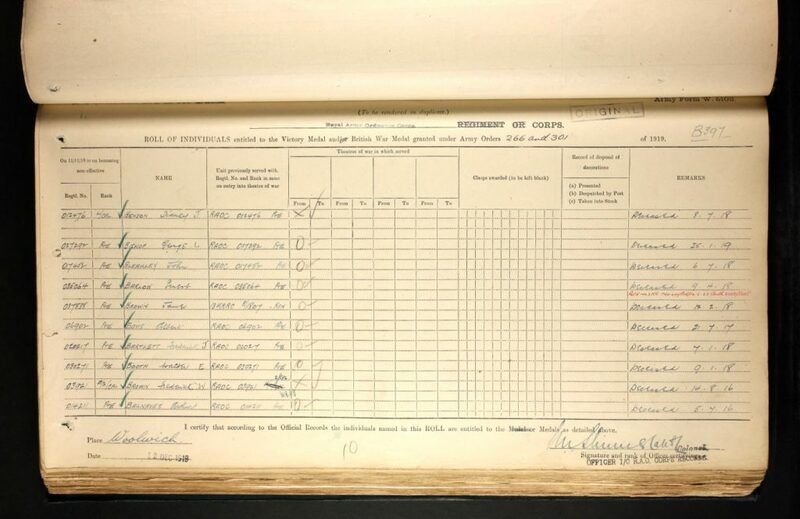 The 1918 and 1919 Surrey, England, Electoral Registers read that George Bishop lived at 67 South Street, Dorking, also known as The Spotted Dog pub. George Bishop Jnr attested on the 12th of February 1917 in Kingston into the Army Ordnance Corps. He was a Private with regimental numbers 28490 and 027292. At the time of his attestation he lived at 183 Elm Road, New Malden, Surrey and was working as a clerk. George Bishop died of malaria on the 25th of January 1919 at sea. He was buried at sea. 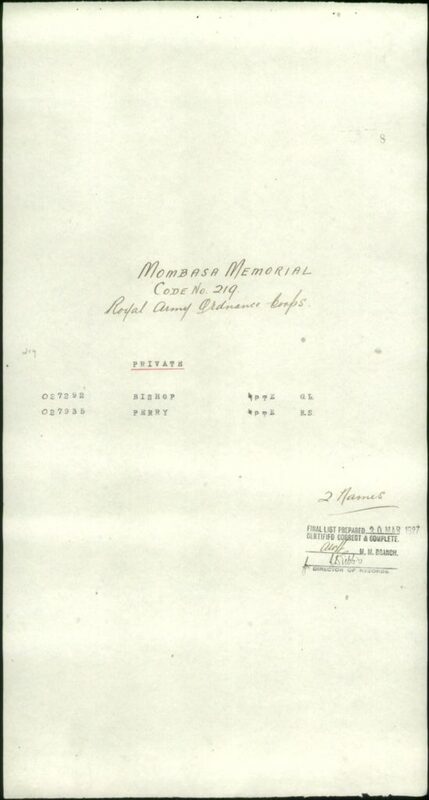 Pte Bishop is commemorated on the Mombasa British Memorial in Kenya. 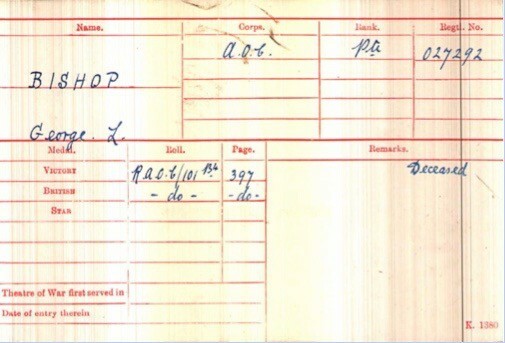 His father George Lewis snr received £14, 6s and 9d on the 1st of August 1919 in Soldier’s Effects. George’s father George Lewis Bishop Snr was born on the 2nd of November 1864 in St James, London, to heraldic stamper James David and dressmaker Elizabeth, born about 1844 in St James, London. George snr was baptised on the 15th of May 1872 in St Luke’s church in Westminster. His mother Kate was born in the 4th quarter of 1864 in Birmingham, to silversmith Thomas, born about 1831 in Willenhall, Staffordshire and mantle maker Frances, born about 1833 in Norwich. 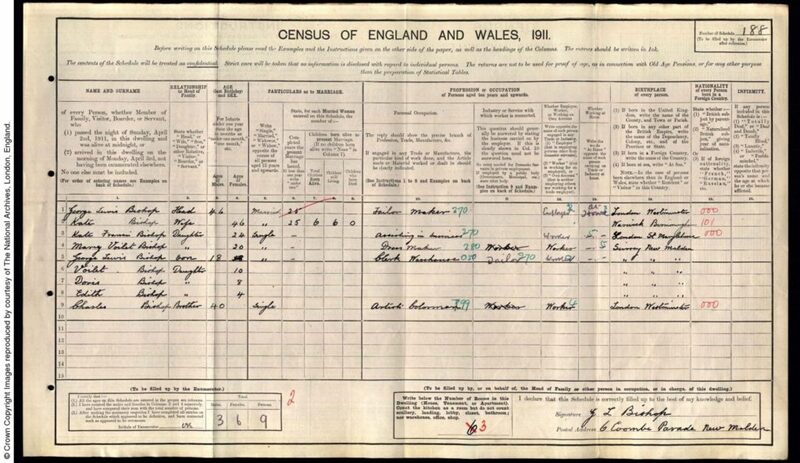 At the time of the 1881 Census, Kate was working as a domestic servant. George and Kate married on the 25th of December 1885 at St Saviour’s Church, St Pancras, London. At this time George Lewis was working as a tailor and lived at 11 George Street. Kate Moreton lived at 41 Whitfield Street. George Lewis Bishop Jnr had five siblings: Kate Frances born about 1887 in London; Mary Violet born about 1891; Violet born about 1901; Doris born about 1903 and Edith born about 1907, all in New Malden, Surrey. At the time of the 1891 Census, the family lived at Wakefield Terrace, New Malden. George Lewis Bishop was working as a tailor’s trimmer and Kate was at home looking after their children Kate and Mary. The household further comprised of George snrs brothers: artist’s colourman Charles and fancy box maker James and his brothers in law: silversmith Joseph; silver polisher Thomas and sister in law, ladies mantle maker, Mary Jane.